My husband and I took a plane trip last week, and I put the wrong type of lock on my luggage. Any lock must be TSA-friendly ones that security can unlock and relock after inspection. I have the correct type of locks, but somehow I got mixed up and used a non-approved lock on one piece of luggage. On the flight to our destination, the bag went through fine. On the way back, we found that our lock had been broken for inspection. We received a nice note that they were sorry to break my lock. I’ll be more careful to use the right one next time. No big deal, right? I’ll just use the correct lock next time. However, the broken lock reminds me of our broken world and broken lives. 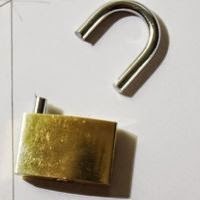 Sometimes our brokenness comes as the result of our decisions – like in the case of my lock. Other times, it’s the result of a sinful world. Did you know that God longs to restore all brokenness? In the Old Testament, God restores jobs, cities, fortunes, the temple and people. In the New Testament, Jesus restores people, and we learn of a time when everything (2 Peter 3:13) will be restored. I was so encouraged to find 144 mentions of “restore” in the Bible. Nothing is too difficult for God to restore. You are the ultimate Restorer. I know you can handle my problem. I trust you. Open my eyes to see how you work.